ShiKai Borage DiabetiCare uses powerful OMEGA-6 oils to promote the formation of healthy new skin cells for long-lasting results. Ideal for hands, cuticles, and fingertips. 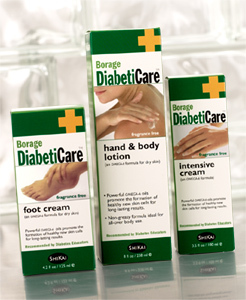 DiabeticCare's non-prescription, clinically-proven, fragrance-free formula prevents and relieves dry, cracked skin. It's not greasy and absorbs easily. No animal ingredients or testing. 3.5 oz. L-ergothioneine (amino acid), diazolidienyl urea, methylparaben. Manufacturer/Distributer: ShiKai Products / Salk, Inc.
"Love this product. Do not want to shop for any other. This WORKS!!! for me, should for all Diabetics. No more 'dandruff' flaking off on my clothes. Yah-Hoo!!" 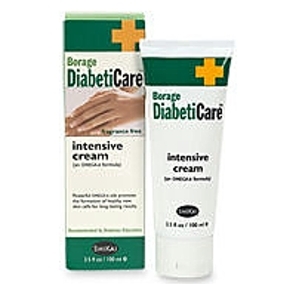 Daily topical application of ShiKai Borage Lotion has a significant positive effect on chronic dry skin associated with diabetes, eczema, atopic dermatitisew pad and press it on. 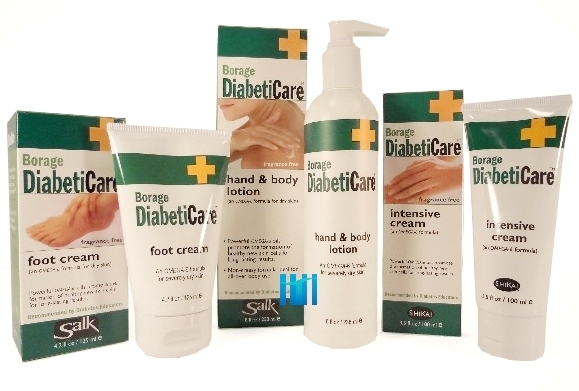 In addition to the Borage Foot Cream, HighTideHealth.com also offers Borage DiabetiCare™ Hand & Body Lotion; and Borage DiabetiCare™ Foot Cream for severe dry skin often associated with diabetes.